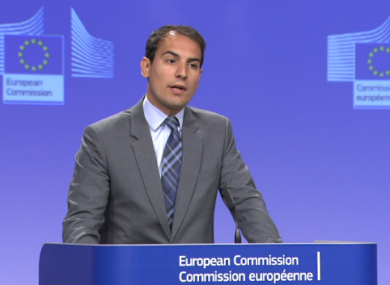 Ricardo Cardoso, spokesperson for the EU's competition commissioner. THE EUROPEAN COMMISSION has said that Ireland would not be obligated to use billions of euro of back taxes from Apple to pay down its national debt. After yesterday’s ruling that Ireland was owed at least €13 billion in taxes from the tech giant, Finance Minister Michael Noonan told RTÉ News at One that the State would be required to use the money to pay down debt. But clarifying the commission’s position today, spokesperson Ricardo Cardoso said that this would not be legally the case. “The amounts that are recovered by a member state in a stated investigation simply go back to the member state’s budget and it can then, of course, use it according to its own decisions,” he said. In his comments yesterday, Noonan stated that budgetary rules meant that Ireland would have to use the money to pay off debt. He did, however, suggest that not all of it would have to be used for that purpose. Ireland’s national debt is estimated at €204 billion. “The commission wearing another hat under their budgetary rules would require monies like this to be taken off the national debt, rather than spent on day-to-day expenditure,” Noonan said. But it would be a matter for the government of the future when the appeals process is completed, if we lose the appeal, there’ll be money there. Obviously the government would take some off the national debt but there might be some scope for investment in capital projects at that point. In 2011, EU member states signed up to the six pack set of economic measures that gave the EU greater oversight of national accounts. Within the rules, it states that adjustment principles “should ensure” that “windfalls” are used to pay down debt. It does not, however, say as a point of law they must be used in this way. (18) The obligation to achieve and maintain the medium-term budgetary objective needs to be put into operation, through the specification of principles for the adjustment path towards the medium-term objective. Those principles should, inter alia, ensure that revenue windfalls, namely revenues in excess of what can normally be expected from economic growth, are allocated to debt reduction. Furthermore, while Ireland may not be legally obligated to use the cash for debt servicing, the commission would almost certainly encourage Ireland to do so. In its most recent set of recommendations for Ireland’s economy, the European Commission recommended that Ireland use “windfall gains” to pay off debt. Use windfall gains from strong economic and financial conditions, as well as from asset sales, to accelerate debt reduction. Following yesterday’s ruling, Apple is required to make good on its €13 billion tax obligation to Ireland. Apple has stated that it will appeal the decision while Noonan is also seeking Cabinet approval to do likewise on behalf of Ireland. Pending both possible appeals, the funds paid over by Apple would be in an escrow account until the appeals process is concluded. Email “EC: Ireland could spend Apple tax money on anything it wants ”. Feedback on “EC: Ireland could spend Apple tax money on anything it wants ”.